At inaugural event in the T.T. and W.F. Chao Distinguished Buddhist Lecture Series, Bhikku Bodhi applies Buddhist ethics to today’s social problems. The Venerable Bhikkhu Bodhi called for solidarity, love, compassion, and justice as an antidote to the crises of our time spawned by corporate greed. He called for a willingness to act on behalf of people in need, near and distant, including future generations, and on behalf of a living planet. 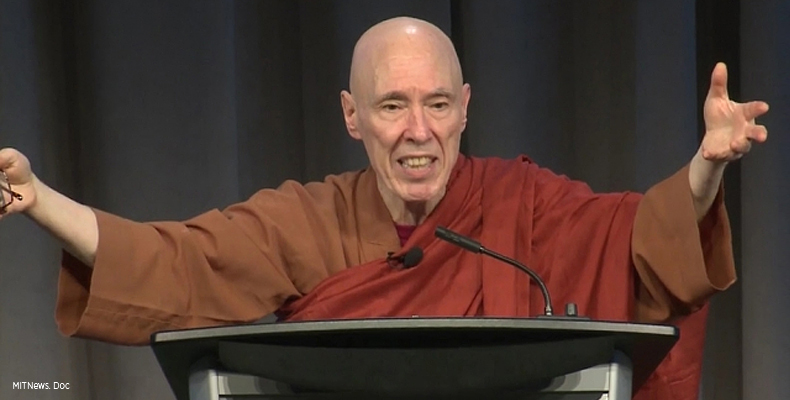 Bhikkhu Bodhi, an American Buddhist monk, spoke at MIT April 19 as part of the inaugural event in the T.T. and W.F. Chao Distinguished Buddhist Lecture Series sponsored by MIT Global Studies and Languages. The bespectacled monk, with flowing orange robes, confided to the audience that he was concerned his talk would be “too radical” and shared his notes in advance with one of the event organizers. He said he was assured that MIT, which has been the intellectual home of Noam Chomsky, would be a suitable place for his remarks. Bhikkhu Bodhi pointed to the social, environmental, and economic problems of today as being driven by “the quest for expanding profits, for higher dividends for shareholders, for higher returns on financial investments, for increased capital accumulation, to be achieved by suppressing of wages and benefits for workers, by precarious contract labor, and by weakening (or abolishing) regulations.” He also spoke about the need for justice by fighting racism and police brutality. Bhikkhu Bodhi discussed the Buddhist Global Relief project he founded in 2007, founded to combat chronic hunger and malnutrition, which does work in Burma, Cambodia, Ivory Coast, Haiti, Nicaragua, and several other countries. The society has a special focus of promoting the education of girls and women as way to combat poverty. Professor Emma Teng emceed the evening’s program. She is the T.T. and Wei Fong Chao Professor of Asian Civilizations and the Head of MIT Global Studies and Languages. Introductory remarks by James Robson, the James C. Kralik and Yunli Lou Professor of East Asian Languages and Civilizations at Harvard University, put the evening’s lecture in the context of an ongoing conversation between Buddhism and science, including the 2003 conference bringing together the Dalai Lama and neuroscientists (captured in the book “The Dalai Lama at MIT”). Robson pointed out the central role played by Bhikkhu Bodhi in bringing Buddhism to a Western audience through his translations of critical Buddhist texts with commentaries. In addition to the public lecture on April 19, which drew 140 people, Bhikkhu Bodhi led a meditation session on April 20 for about 40 students, faculty, and staff, at the Burton Conner dormitory. I’m with the Bikkhu when it comes to defending the domains of true value, and his view about Bikkhus should also be social activists. True value that has been the very foundation of humanity for centuries has been heavily attacked by the abnormal “new normal”; it’s quite saddening to see that true value seems to be on the losing side. We need more people to defend and stand up for the essence that gives us humanity in the first place. An inspiring speech… As far as i know from a friend, the teaching of Buddhism is focusing on one’s self-awareness first before finally go out and make a change in society. Well that’s the hardest thing though, knowing that the worst enemy is ourselves.